Nationals international man of mystery Mark Reynolds was displeased by a called strike three in the top of the eighth inning in Tuesday night’s game against the Phillies, when umpire Sam Holbrook rang him up on an 0–2 outside fastball after an enthusiastic frame-up by Phillies catcher Jorge Alfaro. Reynolds stomped into the dugout and tossed his helmet, and Holbrook, perhaps hearing something over-the-line in Reynolds’s subsequent bitching, gave him the old hook. 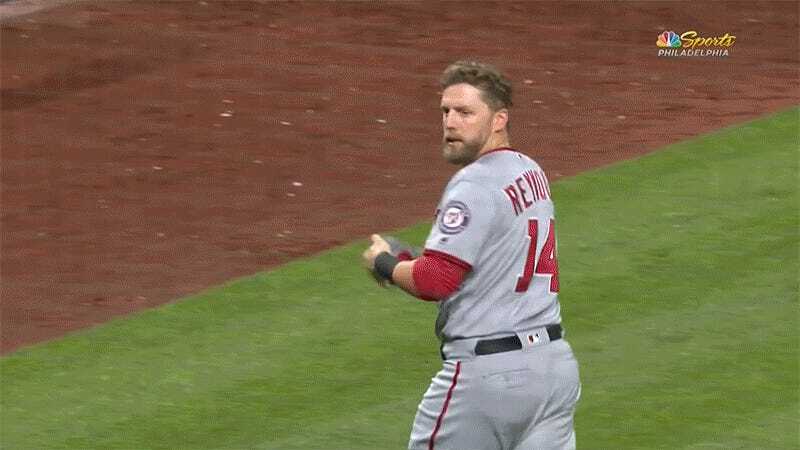 I am very much enjoying the Phillies crowd applauding Reynolds as he throws his batting gloves at the umpire. Philadelphians know a thing or two about spectacularly boorish sports behavior.